The Fellowship was fortunate enough to obtain a copy of THE LEGEND OF OZ: THE WICKED WEST #2 from Big Dog Ink. Tom Hutchinson wrote the story with art by Alisson Borges. To catch everyone up, Dorothy Gale – a no-nonsense gunslinger has been trying to get back home to Kansas. The best way is to find the Emerald City via the remains of what was a gold brick road. Gale (as she likes to be called) encounters a mysterious man with a badge that she calls “tin man,” a chained up lion in clown makeup, and confronted outlaws that turned into flying monkeys. This issue opens with Gale freeing the lion who runs away in fear. She jumps on her horse Toto and renews her quest until she encounters a young Indian girl that the tin man calls “a scarecrow” - a magically animated puppet. Meanwhile, the wicked witch is brought up to speed of what has been going on. Of course, she wants the girl and her little horse too. This is a very interesting interpretation of the classic tale from Frank Baum. Hutchinson does a great job of placing the fantasy tale in a western environment. It seems to bring freshness to the story. I am unfamiliar with Alisson Borges work, but enjoyed what I saw. He blends the fantasy and western elements together and makes it work. I am very interested to see how this version of the story ends. 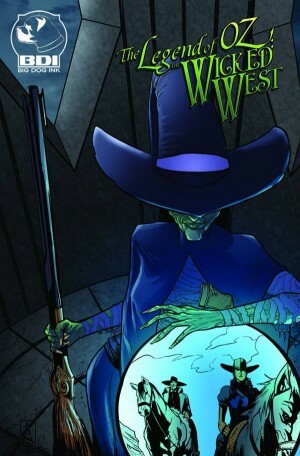 THE LEGEND OF OZ: THE WICKED WEST #2 is out in stores now or at www.bigdogink.com.